We previously started a discussion re: Changing city, town and street names and after giving you the reasons why we do it and which seem obvious, but are incorrect, I left you in suspense, as it were, as to the real reasons we do this. You will, in all probability be offended by the actual factors, but life, my son, often offends. “Why not spend the money that will be spent on name changes on issues like HIV/AIDS, service delivery and education”? And therein, my son, lies the rub. Firstly, and in the words of my previous incumbent (See Thabo Mbeki): “It is not clear as to whether HIV does in fact cause AIDS”. So why spend cash on an unproven scientific fact? You see my point? Why spend tax payer’s (read my) money on something when garlic and rhubarb will in all probability do the trick (See Mantombazana ‘Manto’ Edmie Tshabalala-Msimang). 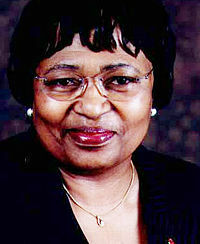 RIP Manto Tshabalala-Msimang. The question is: Did she shower, or did she not! (As an aside, just remember to take a shower after “the deed”. It worked for me). Secondly and more to the point – we spend tax payer’s (see previous comment) money on HIV/AIDS and we save people’s lives. I know it is a fantastic PR opportunity in the short run, but in the long run what the AID (see “irony”) organisations do not tell you is that this causes a population explosion, which means more mouths to feed, more mouths to complain and more mouths to shut up! And being a semi democratic (as it were) dictator, this is intolerable. So, at the end of the day, my son, the first reason is all about manipulating the population, limiting the possibility of a growing opposition and keeping myself where I belong. This entry was posted on Monday, May 7th, 2012 at 06:07 and is filed under Lessons in Dictatorship. You can follow any responses to this entry through the RSS 2.0 feed. You can leave a response, or trackback from your own site.